The French satirist (writer using sarcasm to communicate his message) and political and social philosopher Montesquieu was the first of the great French scholars associated with the Enlightenment (a philosophical movement in the eighteenth century that rejected traditional social and religious ideas by placing reason as the most important ideal). with a long noble ancestry, and his mother, Marie Françoise de Pesnel, who died when Charles Louis was seven, was an heiress (a woman with a large monetary inheritance) who eventually brought the barony (title of baron) of La Brède to the Secondat family. As was customary the young Montesquieu spent the early years of his life among the peasants (poor working class) in the village of La Brède. The influence of this period remained with Charles Louis, showing itself in his deep attachment to the soil. Montesquieu was also born into a climate of discontent in France. King Louis XIV's (1638–1715) long reign was uncomfortable for the citizens of France. His unsuccessful wars and attempts to dictate religion and culture had a bad effect on France. Knowledge of this situation helps to explain some of Montesquieu's curiosity and his interest in societal rules and laws. In 1700 Montesquieu was sent to the Oratorian Collège de Juilly, at Meaux, where he received a modern education. Returning to Bordeaux in 1705 to study law, he was admitted to practice before the Bordeaux Parlement (parliament) in 1708. The next five years were spent in Paris, France, continuing his studies. During this period he developed an intense dislike for the style of life in the capital, which he later expressed in his Persian Letters. In 1715 Montesquieu married Jeanne de Lartigue, a Protestant (a member of the church that had left the rule of Roman Catholicism), who brought him a large dowry (sum of money given in marriage). He was also elected to the Academy of Bordeaux. The following year, on the death of his uncle Jean Baptiste, he inherited the barony of Montesquieu and the presidency of the Bordeaux Parlement. Montesquieu had no great enthusiasm for law as a profession. He was much more interested in the spirit that lay behind law. It is from this interest that his greatest work, The Spirit of the Laws, developed. To free himself in order to continue his scholarly interests, he sold his office as president of the Bordeaux Parlement in 1721. With his newly freed time he wrote the Persian Letters. The Persian Letters was a fierce and bitingly critical view of European civilization and manners. The work takes the form of letters that three Persians (people from what is now Iran) traveling in Europe send to families and friends at home. Their letters are notes on what they see in the West. Montesquieu gave his travelers the foreign, commonsense understanding necessary to effectively criticize European (French) customs and institutions. Yet he also gave his Persians the weaknesses necessary to make his readers recognize in them their own weaknesses. All sides of European life were criticized. The message is that society lasts only on the basis of virtue and justice, which is rooted in the need of human cooperation and acceptance. Although the Letters was published without his name, it was quickly recognized as the work of Montesquieu and won him the approval of the public and the displeasure of the governor, Cardinal André Fleury, who held up Montesquieu's introduction into the French Academy until 1728. 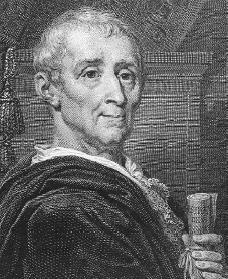 Montesquieu brought his search for the general laws active in society and history to its completion in his greatest work. Published in 1748, The Spirit of the Laws was an investigation of the environmental and social relationships that lie behind the laws of civilized society. Combining the traditions of customary law with those of the modern theories of natural law, Montesquieu redefined law as "the necessary relationships that derive [come] from the nature of things." Laws "must be adapted to each peoples." The Spirit of the Laws helped to lay the basis of the eighteenth-century movement for constitutionalism (government run by established law), which ended in the Revolution of 1789 (1789–93; rise and revolt of the middle class against the failures of King Louis XVI and his royals, many of whom were killed by the guillotine, or chopping block). In this sense Montesquieu's most basic belief may be viewed as an attempt to state the necessity of law review. The Spirit of the Laws was immediately celebrated as one of the great works of French literature. Following the completion of his work, Montesquieu, who was going blind, went into semiretirement at La Brède. He died on February 10, 1755, during a trip to Paris. Joly, Maurice. The Dialogue in Hell Between Machiavelli and Montesquieu. Edited by John S. Waggoner. Lanham, MD: Lexington Books, 2002. Macfarlane, Alan. The Riddle of the Modern World: Of Liberty, Wealth, and Equality. New York: St. Martin's Press, 2000. Shklar, Judith N. Montesquieu. New York: Oxford University Press, 1987.
this article was very clear to me and it was not all wordy like most informational articles. and also i found it kind of boring so i think that maybe next time when you write an article you should not make it as boring and i know that it is supposed to be educational but in the same way there is a way to make things fun and still be edcuational. thanks!